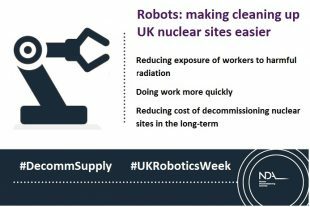 Robotics and technological innovation for nuclear decommissioning is a potentially growing market. This is good news for UK businesses wanting to increase their market. We really want businesses, particularly innovative Small and Medium sized Enterprises (SMEs), from different sectors to embrace technological opportunities that can help us tackle the challenges that we face across our estate. We are always seeking ideas that can help us decommission our sites in better ways. Across our estate we have a number of great examples of where robotics are used to improve productivity and also deal with hazards that require remote handling. These examples include cutting edge technology as well as re-use or adaption of solutions used in other sectors and industries. There is no single answer, which is great for industry. If businesses want to grasp these opportunities in this area, they may want to understand more about nuclear decommissioning issues and find out what other organisations are already doing or planning. To make a new business idea work, it’s important to understand how a proposal improves on current ways of doing things, or how it can be combined with other technology that may already exist or be under development. 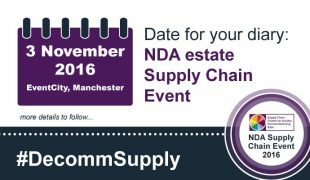 To help organisations network with other companies working in this industry, NDA and its estate run an annual Supply Chain Event. Over 1,500 attendees spend a day networking and sharing ideas. The 2016 event will be held on Thursday 3 November. Over the past few years, we’ve hosted an Innovation Zone at the event that has showcased some of the emerging technologies for use across our estate. Attendees find the event really helpful for developing their business ideas and approach to entering the decommissioning market. We also host an awards ceremony at the #DecommSupply event to recognise both innovation and collaboration. This could be new technology or an adaptation of existing technology from other industries which provide cost effective solutions to nuclear decommissioning. Closing date for applications is 9 September 2016. We’ve already seen some companies working together on robotic solutions for tasks in nuclear plants that are problematic to access by conventional means. OC Robotics have worked with two different SMEs to adapt their dexterous snake-arm robot to tackle two different decommissioning tasks. With TWI Ltd, OC Robotics worked to combine innovative laser cutting techniques to create an integrated system that can be used from a distance to cut up steel plate in locations on nuclear sites where it is not desirable to have people work. OC Robotics then began work with Createc to combine the same “snake” robot with N-Visage™ radiation mapping technology. This transformed version is called a “SeeSnake” because it can “see” radioactivity and depict it in 3D. This means areas that are difficult to access can be assessed for the accurate location and level of any radiation sources. Createc hope to prove this technology at Sellafield. Meanwhile Fukushima continues to be the most prominent short-term application of the SeeSnake concept. This event is the ‘grand finale’ event of the UK Robotics week organised by IET and the UK EPSRC UK-RAS Network. The aim is to bring together academia and industry from countries leading on robotics research, showcase the latest developments from the UK and from around the world and celebrate the success of the first UK Robotics Week. Very informative, I find this to be an interesting topic. Finding more efficient and creative ways to decommission nuclear material is really important especially with how dangerous and expensive it is. However I am not sure about using lasers to cut metal is an efficient or cost productive method of cutting metals. The major downsides obviously is major power consumption. There should be more development going into other methods that are more accurate and consume less power.